These are the words of Dan Dakich on Monday’s edition of his radio show. Was the former Bowling Green and (briefly) Indiana Hoosier coach talking about Tom Crean’s need to keep the Hoosiers motivated as the season gets away from them? Was it a reference to the team’s defense, a day after the Hoosiers allowed 91 points to a dismal Iowa squad? Mental toughness? Ability to handle pressure? At the college level, are these not the things a coaching staff should impart? Players come to campus as teenagers, fresh from being treated as gods on their high school campuses, and are taught to act like grown-ups, right? Then they leave, four years later, ready to be leaders of society. OK, maybe not. At least, not always. But to see a former IU player and the team broadcaster call out the players for the current state of IU basketball, shifting the blame from the coaching staff? It’s an indicator that there are those who will do everything they can to make sure that Tom Crean – and his decade-long Key to the Castle – remain above reproach. Iowa was the fourth conference game this season (Penn State, Ohio State, Northwestern) in which the players took the floor and acted like they had just met each other. That’s not on the 19- and 20-year-olds in the jerseys. That’s on the veteran staff that should be preparing them for every single game. And yet, the day after, there were Dakich and Fischer throwing the players under the bus and yukking it up about the Bears, while absolving Crean of all blame. Rip these players? You mean, the group of young men who chose to come to Indiana University while the program was in the wake of NCAA sanctions that gutted the entire team? Who are trying to bring Indiana University basketball back? The same group of people who were recruited, and have been trained by, the coaching staff and its entrenched leader? How about wondering why the coaching staff hasn’t instilled any of this “mental toughness”? How about questioning those who brought these players to Bloomington, if their play makes you so unhappy? 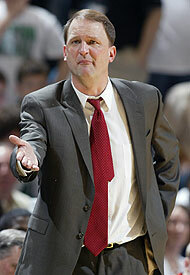 When will Crean be held accountable? What, exactly, are Crean and the staff “bustin'”? Fans’ hopes? Players’ careers? Basketball is a sport where a single player can elevate a team. A single great recruiting class can change a program, if the players are developed properly. Apologists like Dakich and Fischer need to open their eyes. Crean has never developed big men, and his one superb year at Marquette was thanks to a future perennial NBA all-star. Midway through his third year, the team is .500. There is no evidence of a program being built here. Blame the players, Dakich and Fischer? Stop transparently attempting to curry favor with a man whose days as Hoosier coach should be numbered.